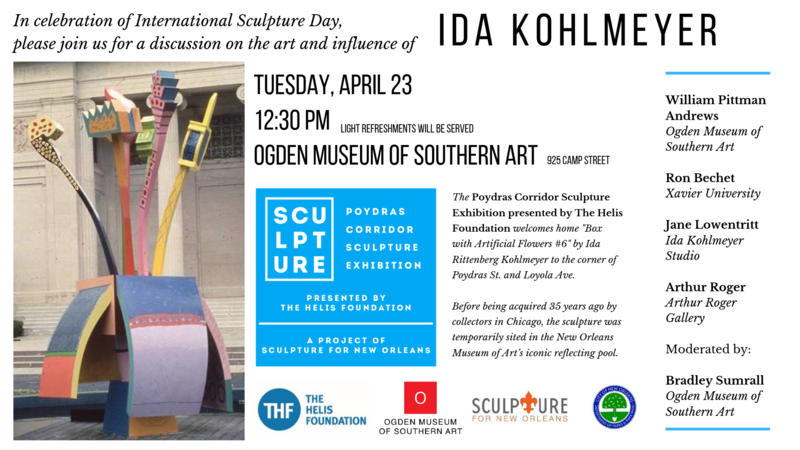 On Tuesday April 23 at 10:00 a.m. a new sculpture will be installed on the neutral ground of the heavily trafficked intersection of Poydras Street and Loyola Avenue in celebration of International Sculpture Day—a series of worldwide events advancing the creation and understanding of sculpture and its unique, vital contribution to society. In New Orleans, the Poydras Corridor Sculpture Exhibition presented by The Helis Foundation (PCSE), the South’s leading rotating public art exhibition, will welcome home Box of Artificial Flowers #6, a sculpture by the late Ida Rittenberg Kohlmeyer. Following the installation on the morning of Tuesday April 23, the Ogden Museum of Southern Art will host a panel discussion at 12:30 p.m. on the life and art of Ida Kohlmeyer featuring Xavier University’s Ron Bechet, Kohlmeyer’s daughter Jane Lowentritt, long-time gallerist Arthur Roger, and Ogden Museum Director William Pittman Andrews, moderated by Ogden Museum of Southern Art curator Bradley Sumrall. Light refreshments will be served.